Not only does spring bring around the warmer weather which urges us to get outside but also the countryside comes to life! The flowers bloom, lambs skip across fields and there’s a feeling of being renewed. This combination means that we absolutely getting out and about in the countryside and thought we’d share some of our top Yorkshire walks. We particularly enjoy a circular walk that brings us back to the start of the walk so you could end up back by the car – hopefully parked near a pub for a craft beer reward at the end of the walk! An eight mile walk, this coastal walk is really beautiful but since you do get the wind from the sea, you will need to wrap up warm! The walk does wind along the cliff side path so we wouldn’t recommend it for anyone that isn’t a fan of that kind of thing! With the North Sea crashing into the shore as you walk the peninsula, it’s a soothing and stunning view. Begin at St Oswald’s Church (YO15 1PE) and after you get back, we’d suggest a pint in the The Seabirds Inn to warm up! You might have visited – or heard of – Howarth because of the famous Brontë sisters. Charlotte, Emily and Anne are famous Yorkshire novelists and poets. Best known for their works Wuthering Heights, Jane Eyre and The Tenant of Wildfell Hall. The Brontë Parsonage Museum is a popular museum and well worth a visit if you’re a fan of their works. Howarth itself is a picturesque town that is absolutely worth a visit in it’s own right – with little shops that you could spend hours walking around the streets. That’s not to forget the location the town sits in! Located in one of Yorkshire’s most stunning areas, begin at St Michael & All Angels Church (BD22 0HB) and then you can head across Howarth Moor, see Bronte Waterfall. Be sure to head up to Top Withens – the inspiration for Wuthering Heights so a must see! Finish at the Haworth Steam Brewing Co. The Harewood walk winds around the beautiful Harewood House grounds. Park in the lay-by at the end of Wike Lane (LS17 9LU.) Along the route, you’ll discover views over the deer parks – if you’re lucky, you will see the deers and stags frolicking and playing, pass the outside of the Emmerdale set and make friends with some friendly farm animals on route! Harewood House itself sits grandly in the background for much of this walk. This walk often gets very muddy in parts if it’s rained recently so make sure you’re wearing suitable shoes. Also – there’s some steep parts of the walk so just make sure you’re up for it before you set out as you can’t stop once you’ve set off! It’s not at the end of the route, but you could potter down to the middle of Harewood to enjoy drinks in the Harewood Arms afterwards and hopefully you’ll spot a Red Kite or two, birds that have been reintroduced into the area. Sitting in the Washburn valley just north of Otley and West of Harrogate. Walk around the reservoir which is around 3 miles, it’s an easy walk and enjoyable watching the swans and ducks! The picnic area is ideal for unpacking your lunch and enjoying it outside with a view! Pork pies are the ultimate picnic snack since they’re easy to carry and share, plus, they’re delicious with everything! From the visitors centre, pass Swanley Grange and follow signs to Fountains Hall. From here, meander down into the deer park and follow the signs back. A really scenic walk, the deer in the field and the Abbey in it’s crumbling beauty are sights to behold! You will begin and end at the Abbey so eat your picnic at the beginning or end of your walk! Fountains Abbey is one of the largest and best preserved ruined Cistercian monastries in the whole of England so we’re lucky to have it on our doorstep here in Yorkshire! It was founded in 1132, operating for 407 years and was one of the wealthiest monasteries in England until it was unfortunately suffered dissolution under the reign and order of King Henry VIII in 1539. There’s so many stunning walks to take this spring to enjoy being outside in the countryside. These are our top circular walks – what are yours? 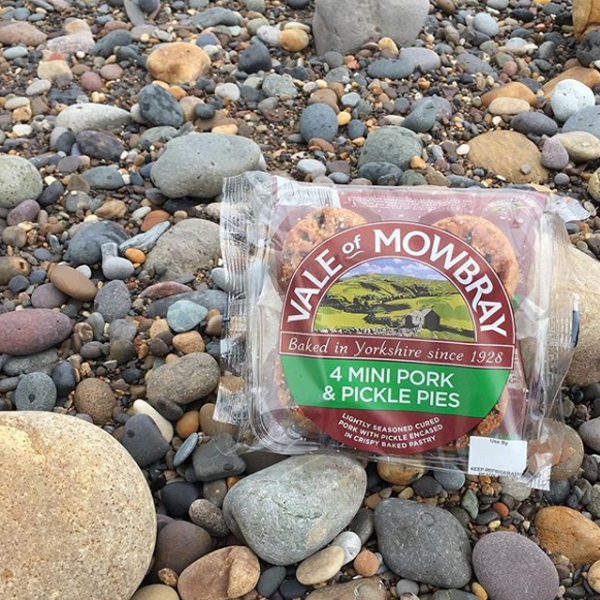 Be sure to remember your pork pie picnic, it’s a lovely day trip out for the whole family and a great treat to give you fuel up the hills!